An extra special way to say �Thank You�, our Starbuck�s & Fruit basket will send the message you are trying to express. Fresh, juicy oranges and crisp green and red apples start them off, as well as three different bags of delicious Starbuck�s Coffees: Breakfast Blend, Caffe Verona and delicious House Blend. 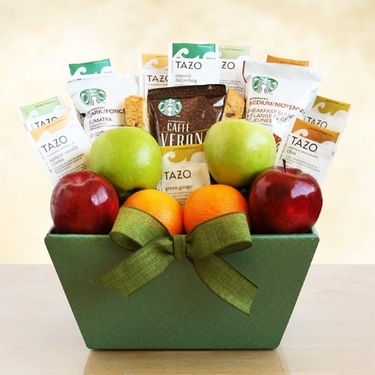 Add in an assortment of tempting Tazo Teas and Nonni�s biscotti for a great thank you gift to give and receive. Due to Dept. of Agriculture regulations, this item may not be shipped to Arizona or Idaho. Please call us at 620-718-0025 for further gift suggestions. Orders placed online Friday, Saturday, Sunday, and Monday through 1 PM CST will ship on Monday. Shipping options are 3 Day, 2 Day, Next Day, and Ground in Zones 1 and 2. Orders placed by 1 PM CST on Tuesday will ship out via 3 Day, 2 Day, Next Day Air, and Ground in Zones 1 and 2. Orders placed by 1 PM CST on Wednesday will ship out via 2 Day or Next Day Air. Orders placed by 1 PM CST on Thursday will only ship out via Next Day Air. Orders placed after the daily fruit cut off of 1 PM CST will be processed the next day, so please pay close attention to shipping restrictions.